Another year, another Chronicles of Narnia Reading Challenge. 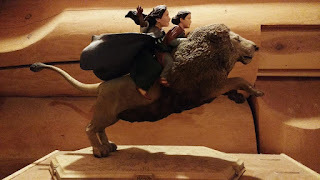 This year I asked my kids which book from the series they'd like to read and they collectively voted to re-read The Lion, the Witch, and the Wardrobe so that's what we did. I feel the story is well known enough that I don't really need to bother with a description of it so I'll skip straight to sharing our experiences this go around. For starters, we ordered a box of Turkish Delight to be enjoyed every day during the reading. This is an annual treat for us and each of the children get a piece (or two) to enjoy each day. It's all very exciting and we enjoy it. If you've never had it, you've got to give it a try! There are multiple brands available on Amazon at fairly reasonable prices. This is the third year that my oldest has listened to this particular story and he has it down pat for the most part. My second son also remembered a great deal of the story but despite the number of times we've referenced this book, my third born (age 5) didn't recall much of what happens in the book and I was therefore reminded of the importance to keep at this reading challenge, even if no one else ever joins in. This reading challenges gives us a reason the excuse to keep this series ever before us. They are worth reading over and over again and I'm glad to have a special month set aside for it. This year's reading was also special because Bookworm5 is new to the family and she was given a Narnian name to match her siblings. (Four out of five of our kids are named after C.S. Lewis/Narnia in some form or fashion and so you can correctly ascertain that these books are sort of a big deal to me.) I didn't read this series until I was an adult but each year I re-read them I find that they have the incredible ability to drive certain scriptural truths home to me in fresh new ways. It should also be noted that the stories themselves are so imaginative it's easy to relax with them for the simple purpose of enjoyment. "We have a long journey to go. You must ride on me." Aslan, as most scholars will agree, is representative of Jesus Christ. 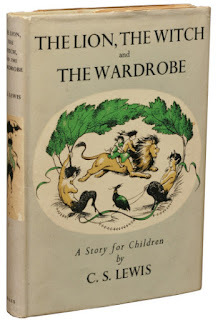 In this book he appears as a fictional character with enough things in perfect comparison so that by knowing Aslan for a little in Narnia, we might know the Lord better here in our own world. I love how Lewis describes the power and the might that is Aslan in this passage. ". . . [T]his is a mount that never grows tired." Aslan had just made the ultimate sacrifice and yet rose victoriously back to life as a result of a deeper magic which the White Witch did not know. Death defeated, life triumphant! Still, there was work to be done. Peter and Edmund, along with a host of other Narnians were in the thick of a raging battle against all that was evil in Narnia. Their valiant forces were surely weary. 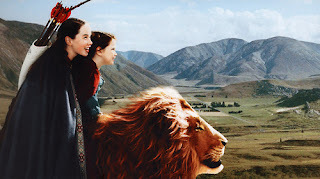 Aslan, resurrected, thinks of them and begins actively working to bring them relief (and ultimate victory) but in this midst of this he also does not ignore Susan and Lucy. He will not leave them behind at the Stone Table. It is clear that they must come with him but Aslan also knows that they do not have the strength to go on running and fighting this battle. They can't possibly hold up. So what does he do? He tells them to climb up on him and ride on his back. He will bear their weight and he will carry them the distance necessary so that they might participate in and know the victory for themselves. Wouldn't it be easier for him to leave them behind? Perhaps, though it wouldn't have fulfilled the prophesy now, would it have? Friend, are you weary? Climb up. There is likely still a long journey to go but the Lord invites you to ride on His back, so to speak. The Creator of the ends of the earth does not grow weary. Wait on Him. He will renew your strength. If you feel like you can't walk, and/or the distance from here to relief and victory is far too great -- RIDE! He invites you to do so. I have this sculpture at the top of one of my bookcases. I've loved it because it represents my favorite scene from this book but this year it means a little more. The road of life is long and filled with sorrows, sadness and challenges. But my ride is strong and does not faint or grow weary. Remember this, friend. Remember! You aren't being left behind in some remote place where you will be forgotten. The Lord invites you to come with Him, to participate in and to enjoy His victory. For the glory of the Lord, RIDE! I only vaguely remember that passage - thanks for the reminder. Love the figurine! Beautiful post! Thanks for the encouragement! Your post fed my soul. Thank you for the reminder and encouragement! Oh, thank you, thank you, thank you for sharing this. I've been feeling rather weary (who'd have imagined it - I'm only mothering for a 20 month old and a premature newborn and trying to maintain a home while recovering from a c-section during tomato canning season!) This was exactly the reminder I needed that I'm not called to walk this life on my own, that God doesn't just *give* strength for my circumstances but *is* strength for my circumstances. Great post Carrie! What a good reminder. I am re-reading this one this year as well.